Unless a drum extractor is a real dog, I'd plump for one every time over the bag type. Why? Because they just sit there and work when you flick the switch. No awkward bag changes and yes, no bag admittedly, but emptying isn't any worse than bag juggling. 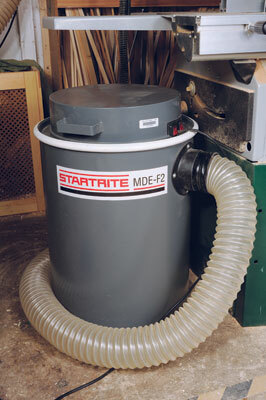 The Startrite sits next to the workshop tablesaw but away from the working side, it would fit easily under an out-feed table or nearby bench as well. At 80 litres capacity it holds plenty, the trick being to check regularly that it isn't full to bursting. 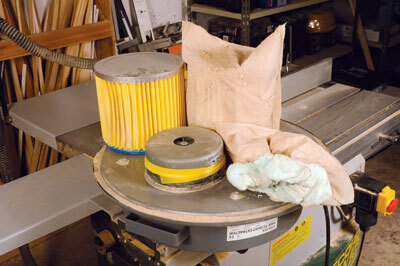 The suction capacity is great and in my experience these types of machine draw dust and chippings down very efficiently and if the hose ends up on the floor it can pull the drum over. Indeed, the large pipe bore doesn't reduce its suction ability at all and at 100mm bore it will match with smaller dust producing machines. Each motor is switched separately to suit the size of the task in hand. Emptying involves springing open a rather stiff ring clamp that holds the motor fan unit in place and even stiffer pulling it tight again afterwards. Inside, each fan has a pleated filter over it, which in turn has a fine filter bag with a porous covering and soft filter material inside. I always wear PPE when I tip out the contents and use a bigmouth dustpan to collect and bag the waste, it doesn't take long. Apart from brushing down the filter bags I haven't taken the filters off at all so it was somewhat surprising to find virtually no dust had penetrated through the bag to the pleated filters after a year of operation. Very impressive.